With authentic furnishings based on genuine Indian examples, our Indian Bath is unique in Germany. Our therapists, who trained in Kerala, India, invite you into these exclusive facilities to experience the ayurvedic treatments. You are welcome to use the bath’s own garden which features a wooden tub filled with Bad Krozingen thermal water. 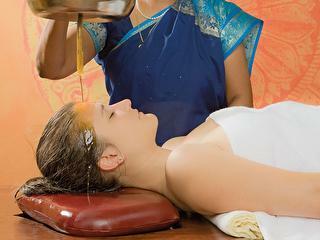 Abhyanga massage with warm tri-dosha oil and Shirodhara (forehead treatment). Approx. 130 min.